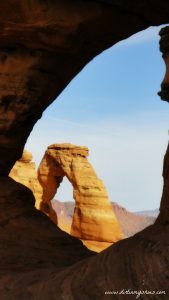 Surround yourself in the stunning red rock cliffs, distant views of snow-capped peaks, winding painted canyons, and of course, the most breathtaking natural arch in the world, Delicate Arch. No trip to Utah is complete without seeing our state’s most iconic landmark! 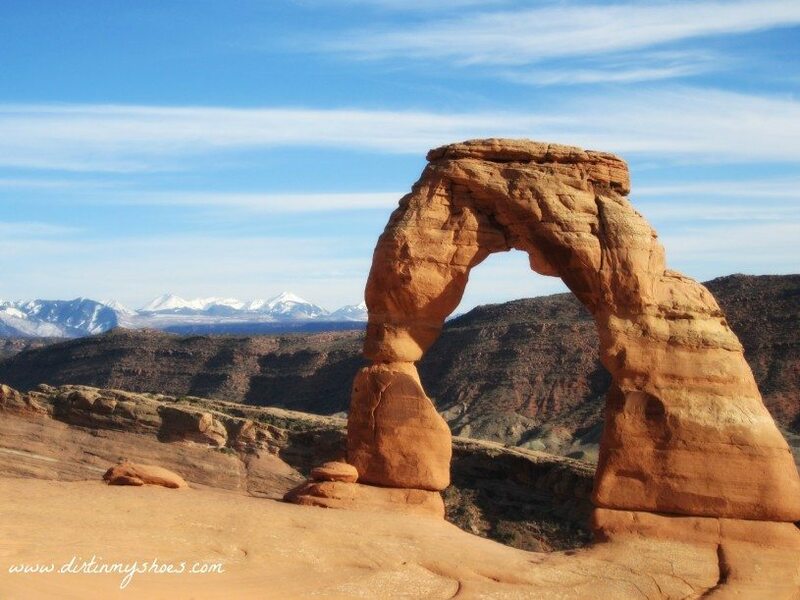 Experience, in person, this arch’s ability to “startle the senses and surprise the mind” (Edward Abbey). I have probably hiked the trail to Delicate Arch a dozen times, but the moment that I turn the corner and finally catch a glimpse of the arch, I still get goosebumps. It is spectacular! No picture I have ever seen does it justice. You really have to be there to witness the grandeur and beauty of this stunning formation. This hike may even be the highlight of your tour of the Utah National Parks! Getting an early start is the best advice I can give as you embark on this trail. First of all, the parking situation at the Delicate Arch trailhead is crazy and busy at almost any time of day, but especially around 9:00 a.m. and later. Second, you will appreciate the arch much more if you are not surrounded by a million people! Water is not available at the trailhead, so be sure to fill up at the Visitor Center on your way in. Please don’t ever hike without plenty of water, especially in the desert. 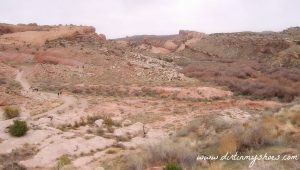 The Wolfe Ranch marks the beginning of the trail to Delicate Arch. This old homestead was built in 1898 and abandoned in 1910 by John Wesley Wolfe and his family. As you peak into the cabin, imagine what it would have been like to share that home with five other people! 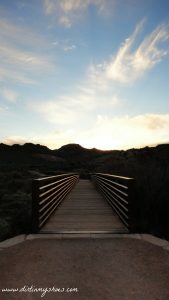 From the old homestead, a beautiful bridge crosses the Salt Wash and takes you to the main trail to Delicate Arch. 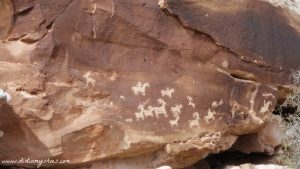 Just after the bridge, a short spur trail branches off the main trail and travels to a panel of ancient Ute Indian petroglyphs. On the panel you will see horses and bighorn sheep, thought to depict a hunt that would have been common for the natives in the area. 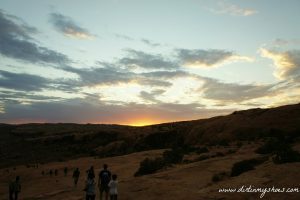 Now it is time to get serious about hiking to Delicate Arch! The trail is wide and flat, wandering through a typical and wildly beautiful desert landscape. Be prepared to share the trail with the masses that flock to this area of Arches, and please be courteous and patient with those around you. 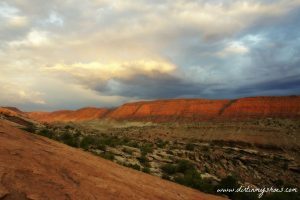 The well-defined red dirt trail soon transitions to a hike on a giant slab of sandstone that climbs a few hundred feet in elevation. The views from here are phenomenal! This section of trail can get extremely miserable in the heat of the day because the sun’s rays reflect off the rocks and there is no shade to be found. Take care to drink plenty of water along this stretch. You will notice that there is not an actual “trail”, but rather there are small piles of rocks marking the way to go. These are called cairns — please do not build your own or knock down existing ones. Following the cairns are a critical part of making it to Delicate Arch, and if you get lost along the trail, it will most likely be while hiking along the sandstone slab. I’ve met plenty of people who didn’t actually make it to Delicate Arch because they didn’t exit the slickrock section at the right place! As you follow the cairns, they will lead you off of the slickrock (to the left) and onto a narrow dirt trail that will take you the rest of the way to Delicate Arch. Be on the lookout for Frame Arch above you. If you decide to make the short climb up to it, you will get your first glimpse of your destination! 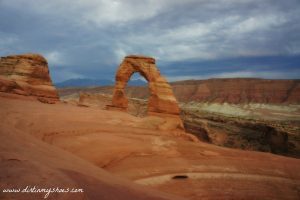 My favorite part of this hike is next….the part where you come around the curve and the view opens up to the iconic and vast landscape that surrounds Delicate Arch. There are no words to describe the sheer magnitude and majesty of this spectacular freestanding arch! The sandstone bowl in front of the arch causes the hike to the base of the arch to slope downward. Watch your little ones in this area and expect crowds to line the way as you trek to the base. No trip to Delicate Arch would be complete without standing at the base and gazing up at the beauty that is directly overhead! You will be amazed by how small you feel compared to the arch that has weathered the elements over many, many years. Although you may be tempted to stay for a while, it is courteous not to linger near the arch for too long in order to accommodate the other people you are sharing this experience with. 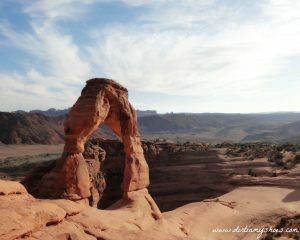 The magnificence of Delicate Arch will take your breath away! I suggest planning enough time to sit and enjoy your surroundings (and to hopefully snag that perfect shot). Snapping a people-less photo is not easy, but if you want a few pointers, be sure to reach out to me here. I am happy to provide advice based on your specific itinerary! 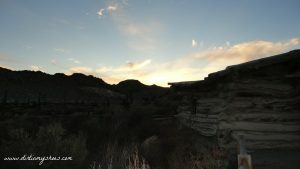 Watching the sunset as we hiked down the trail was the perfect ending to a perfect hike! The trail to Delicate Arch is 3 miles roundtrip. I would rank it as a moderate hike because of the lack of shade, the uphill climb on top of the slickrock, and the navigation required by following the cairns. From the Visitor Center, drive 12 miles and then take a right toward Wolfe Ranch. Drive another 1.2 miles until you reach Wolfe Ranch. 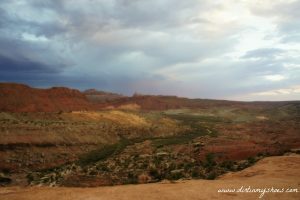 This is the trailhead for Delicate Arch. 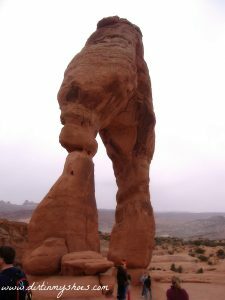 I have hiked the Delicate Arch trail two or three times, but I haven’t been back in about 15 years. My husband is afraid of heights and I can’t recall if that last stretch of trail just before you round the curve has a steep drop-off on the left. I’ve been trying to convince my husband to hike the trail, but I’d hate to lead him into a situation that would cause him to be in distress. Any help would be appreciated! You’re right, there is a drop-off to the left as you approach the arch. I always remember it being bigger than it actually is though….and the trail is pretty wide right there. We were just up there a few weeks ago and I was again surprised that the drop wasn’t as far as I had remembered in my mind. If he’s not extremely afraid of heights, I think he’ll be just fine! Thanks for the info! I think he’d probably be fine on the way up, hugging the rock wall on the right, but he might have a bit of anxiety on the way back down… I don’t have that fear, so it’s hard for me know how he’ll react until he’s in it. I guess, at the very worst, he can wait on the slick rock before the curve while the kids and I trek the last leg up to the arch. Thanks for your help! Yeah I don’t have that fear either so it’s hard for me to say for sure, but I do think it’s worth a try 🙂 Have fun! I’ll be quite honest with you and say that my family (kids ages 6-15) is a bunch of out-of-shape wusses. I think we can handle some of the easier hikes, like Landscape Arch and the Windows, but you have me a little scared to do this hike. We’ll be there this weekend so I’m hoping the hot weather isn’t an issue. Assuming it’s not, do you think we’re capable of tackling this? I mean, we can walk 3 miles. Just not sure we can hike it. Hey Darcy! It’s hard to say, but most people can tackle this one if you take your time and bring lots of water! I would recommend starting with the shorter hikes to see how they do on those, just keeping in mind that Delicate Arch is the most rewarding and breathtaking one of them all 🙂 If you decide the hike is going to be too much, there is a Delicate Arch viewpoint that is a good alternative. With my limited knowledge of your family, I would say go for it!!!! The effort to get there is absolutely worth it — you will be speechless! Hope that helps! Hi Kea! Thanks for sharing your experience! We actually did the same thing and ended up getting a little lost on the slickrock section as well haha. It was worth being at the arch at sunset though 🙂 So glad that you got to experience that!